Eco-friendly living goes beyond just conserving the natural environment for current and future generations of humanity. Human life is part of a wider ecosystem that involves various kinds of living things. A healthy garden brings the benefits of a natural ecosystem to your home, benefiting you, plants and other living things that form part of this habitat. Simple changes and practices have the potential for making your garden more environmentally safe. Here are five ways to help you enhance your home eco-system through greener practices. Some insects are beneficial to gardens as natural pest control mechanisms and pollinators. Knowledge of the types of harmful insects or the ways to establish whether an insect is beneficial to your garden is an important, necessary step to using this strategy effectively. Take care not to end up attracting types of insects that are harmful to your garden. Bees are common garden-friendly insects. Enhance the structure of your garden and plant bee-friendly plants to attract bees. Contact a pest control expert for help in determining whether the bug in your garden is beneficial or destructive where necessary. Keep in mind that beneficial insects do not form a sufficient pest-control program on their own in most cases, but work effectively as part of a wider pest management program. Toxic products are one of the most common causes for concern when it comes green living. Products with toxic compounds can get you sick, but they also pose major risks for your garden. Some home cleaning products are common culprits in this regard. Small mistakes when handling toxic cleaners, such as using contaminated containers to hold water for watering your garden, have the potential for contaminating the entire garden. Organic cleaning products are an ideal replacement for toxic cleaners. Chemical-based insecticides are another major cause for concern. Like toxic cleaning products, most chemical-based products contain harmful compounds that pose risks for your health and your garden. Use insecticidal soap products to eliminate the negative impacts of pesticides. A simple do-it-yourself procedure involving a mixture of bar soap and water is an inexpensive way of replacing toxic pesticides. Commercial alternatives are more effective than home-made pesticides because producers use appropriate levels of compounds to form soap-based insecticides. Recycling presents an opportunity for the society to address the problem of depletion of natural resources. Your garden benefits from recycling while you also contribute to conserving nature by reusing things. Buy recycled products or reuse items where possible. Manufacturers are increasingly recycling materials such as copper, rubber, plastic, and wood in the attempt to minimise the negative impacts of extracting materials from the natural environment. Set up a recycling and compost bin to help you take advantage of organic soil regeneration. Compost grass cuttings and vegetable waste from your kitchen, and use the manure to regenerate your garden. Compost serves as an alternative to chemical-based fertilizers and enriches the soil in many ways, including improving texture, water retention and aeration. Sufficient water is necessary for a healthy garden, but some watering habits constitute wastage. Proper timing reduces the amount of water required to achieve the desired moisture level. Water your garden early in the morning or late in the afternoon to minimize evaporation. 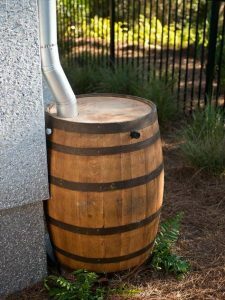 Fix leaking garden hose spigots and collect rainwater using a rain barrel, which lets you add a chlorine-free source for watering your garden plants. Harvesting rainwater reduces water bills and prevents erosion and flooding. Choose your watering tools carefully to minimize wastage. Drip irrigation, for instance, uses about half the amount of water that sprinklers use. An energy-efficient garden uses the minimal amount of energy required to remain healthy. Garden lighting presents an opportunity for enhancing the appearance of your garden at night, but it is also a major point of weakness as regards energy consumption. Switch to energy-efficient bulbs or lamps, which include light-emitting diodes and fluorescent bulbs. Go for solar-powered garden lighting to turn your garden more eco-friendly. Solar lights may not create the same large amount of lights as conventional low-voltage lights do, but they are better at saving energy. Use automatic watering devices and other electrical appliances with built-in timers and configure them to power off when not in use. Opportunities for saving energy in your garden depend on your garden practices, and in some cases occur anywhere in the home environment. Fixes to leaking indoor water systems to avoid flooding the garden and as a result having to pump away the excess water are proactive measures for saving energy. A green garden boosts your home’s green status and comes with major benefits for you and the environment. Simple changes to your garden practices can transform it into a healthier, more eco-friendly garden. Whether you are looking to enhance the appearance of your outdoor environment or do your part in conserving the environment, add these five tips to your strategies for improved results.